Office Zombie Hits #1 Worldwide! It is difficult to believe that it has been five whole months since Office Jerk hit number 1 in the iTunes App Store. 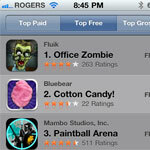 We are pleased to announce that our latest game in this series, Office Zombie, has achieved the #1 rank as well. The objective in Office Jerk was, simply, to huck stuff at your coworkers, which is something many people would like to do in real life. That seems to be what mobile gamers are after. Simple, mindless entertainment. Office Zombie, however, has everything that Apple had previously banned from Office Jerk. They will not permit things like knives, chainsaws, and other dangerous objects to be used as weapons against humans. They won’t allow blood, either. So we went with zombies. After all, who cares about zombies? To heck with them! The original Office Jerk was a flash game that I built years ago. It was extremely complicated, and involved climbing the corporate ladder by strategically choosing office enemies. The iOS version of Office Jerk does not have the same depth, but is much more polished, and actually great fun. Office Zombie comes just in time for Halloween. We intend to release many more such games in the months to come, so check back here regularly for details. This entry was posted in Office Jerk, Office Zombie on September 27, 2011 by admin. The perfect game for everyone that loves to hate zombies and well, just hates work. In cooperation with Fluik Entertainment, we offer you a seasonal twist to our previous app, Office Jerk. Office Zombie arrives just in time for Halloween. If you have an iPhone, iPod Touch or iPad, be sure to grab our latest creation form the app store! This entry was posted in Office Jerk, Office Zombie on September 23, 2011 by admin.